Fantasy Moon from Pebeo is a multi-surface craft paint consisting of 18 colours that transform before the eyes! Easy to use, can be applied with a dropper, brush or directly from the bottle on flat and horizontal surfaces. The Moon effect reveals itself while drying to show a beautiful rippled, hammered pattern. Solvent based, opaque and glossy. 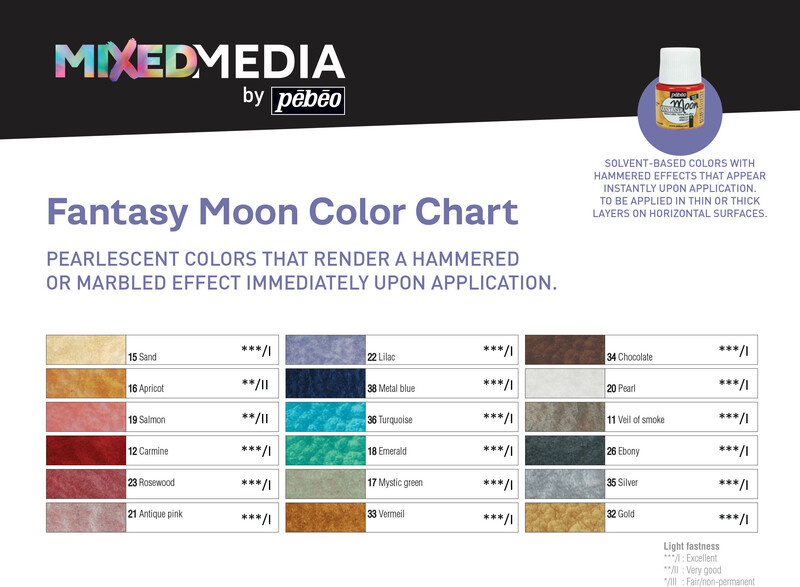 Easy to use Pebeo Fantasy Moon can be applied with a brush or dropper in thick or thin layers. It's ideal for the decoration of all surfaces including: metal, china, terracotta, acetate, ceramics, boards, canvas, mirrors, glass, wood and much more. Fantasy Moon colours can also be mixed with each other, with the Fantasy Prisme colours and also used on wet Vitrail or Ceramic colours which gives a beautiful marbled effect. Perfect for mixed media - also a favourite for jewellery making. This workbox contains the following: 10 Pebeo Moon 45ml Pots (Pearl, Carmine, Metal Blue, Mystic Green, Lilac, Apricot, Rosewood, Gold, Veil Of Smoke & Turquoise), 1 brush, 2 palettes, 1 leaflet.